You may hear someone say, “I’ve reached my limit!” or, “He has stepped over the line!” They complain about others working on a project—partners, teammates, managers, staff, or leaders—and about other ways of doing things. With compassion, you nod and listen. Conflict is no stranger to any of us. Many people rely on a plan-work-argue-limit approach when working with others on writing or other projects. Everyone is aware of no-fly zones and assumes these will be respected. Then someone crosses a line. Another person objects to the current direction. A defender justifies the position. Others watch. Research may be done to find precedents and examples for doing things a certain way. The tug-of-war continues until no one cares any more. If this is your collaborative reality, it’s time to change it up. A conversation, a project, an action—none of these has to be based on a sense of limits, opposites, or judgement. Remember the 10 laws of collaborative writing? None of these laws says anything about the digging in of heels or of the need to advocate for a particular way of doing things. Au contraire: collaborators are encouraged to respect one another (Law 2) and to check their assumptions (Law 6). … a good conversation employs a kind of parallel thinking where ideas are laid down alongside each other, without any interaction between the contributions. There is no clash, no dispute, no true/false judgment. There is instead a genuine exploration of the subject from which conclusions and decisions may then be derived. In a note to yourself, describe the activity, context, or behaviours that set off the reaction. Carefully describe what emotions you feel and what you would like to say. Make as many notes as necessary. Are there any matters in this issue on which you are an expert or authority? List those and describe the challenges that this situation has posed. Outline your expertise on the matter. Listen and write down other points of view that are being expressed. Did you really hear everything the other parties were saying? Make an effort to get what they are saying. If you are still talking with them—and good for you if you are keeping a civil conversation going—try paraphrasing their points out loud and asking if you have it right. Ask them to tell you more about where they are coming from. Ask questions and keep the tone collegial. Why does the person hold that opinion? Do others agree? How did this gain acceptance? What assumptions are we each making? Where is the data to support that assertion? Did I miss something? Is there another way to look at it? What will I gain by pressing the point? What does the other person gain? Who is accountable for the matter? There are no right or wrong answers to these questions; it’s the exploration that counts. Remember that no one is in sole possession of the truth. Sometimes our limit buttons are pressed when something touches a nerve. A strong emotional reaction is a sure sign of that. We may not be conscious of how it happened. It may have nothing to do with the work that is being done. We just feel invaded and want express that loudly. It may not even have been intentional on anyone’s part. Thing is, all our perspectives can coexist. They already do. We just didn’t notice before. And even if everyone disagrees with you, it does not mean that you are wrong! Substitute the word “and” for the word “but” and draw the perspectives of others alongside yours. It is just too easy to dismiss other points of view. It is hard to find good reasons for the opinions of others. Use positive expressions during a discussion. Negative expressions tend to block advancement in discussion and set an adversarial tone. You may be right, but that doesn’t mean everyone else is wrong. Invite different opinions and look at them together. Seek advice from a trusted colleague. Discuss the situation with someone who knows you and has your development and best interests at heart. Give it time. Relationships take time and understanding to build. If you have done the other things listed here, you are already doing the work. Congratulate yourself, as your understanding has grown three sizes already today. Talk it through with the person or group calmly. Have a real exchange on the topic that means so much to you and outline the thinking of all parties on a whiteboard. Make sure the implications are explored. There is real achievement in being able to hold a calm conversation in which an issue is explored and resolved. How have perspectives shifted? Where has the discussion taken you and your colleagues? While deadlines press the team to get the work done, a discussion can still take place. Solutions can emerge. There are few limits to what can be accomplished by team members who effectively address the issues that come between them. 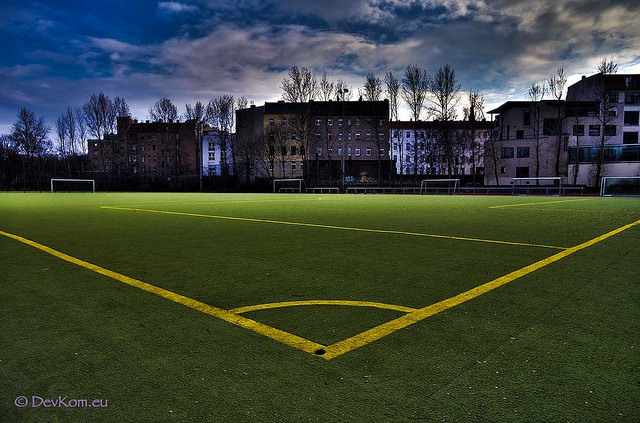 The photo, “Soccer Field,” is by Devesh Komaromi. It is used with permission. His striking photos can be found at devkom.eu and through Flickr. These are certainly rules to live by in your personal and working lives. Especially the one that states “Remember that no one is in sole possession of the truth”; oh how true that is and how often so many forget. Nobody likes a no-it-all. Wasn’t that a lesson in Primary school? This is just what I needed for a meeting this morning and another next week. I am your newest subscriber, and I am glad I found you on LinkedIn. Your writing is excellent and distraction-free, too! Thank you, Deirdre, and let me know how your meetings go. Wonderful to hear you sound so motivated to go in there and work it through! Thanks, Max! Your comments are helpful. You and your blog are inspiring.